Betting on esports comes with the opportunity to claim and redeem generous bonuses, cash-back offers and other real money incentives which add additional value to your account and maximise your esports wagering experience. Both traditional sportsbooks and esports-focused betting sites have much to offer their customers, but we’ve found a surprising lack of reliable information online for esport bettors looking for decent bonus rewards. This page will compile all of the latest bonuses available at the top-ranked esports betting sites around the world, for your convenience. The team at EsportBet.com has scoured the Internet for the best possible sign up bonuses, match deposit bonuses, cashback offers and even created our own exclusive esports betting bonus with certain sites for our readers to take advantage of. We break down the best bonuses per top-ranked esports betting site, and you can find full reviews of each sportsbook by clicking the provided links. Make sure to bookmark this page for regular esports betting bonus updates. One of the best esports-focused online betting sites out right now, Arcanebet.com offers betting markets on both popular and niche esports tournaments like CS:GO, Dota 2, League of Legends, Overwatch, Rocket League and World of Tanks. if you sign up to Arcanebet via Esportbet, you can score yourself two great bonuses within minutes of registration to wager with. 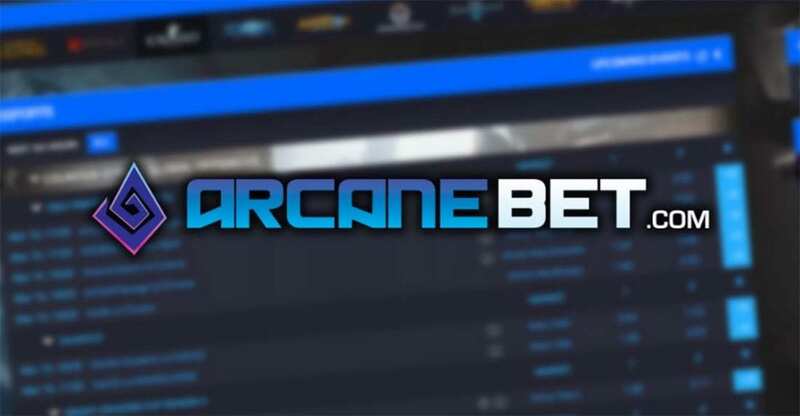 For more information, please read our Arcanebet esports betting site review. Arcanenet sign up bonus: All new players at Arcanebet can claim up to $/€100 (or other currency equivalent) in bonus cash upon making their first deposit after registration. All you need to do is deposit at least $/€10 (the minimum required) and enter the bonus promo code ‘100ARCANE’ in the Deposits section before you process the payment. Arcanebet will match the amount of whatever you deposit by 100% up to $/€100, so you effectively double your account balance with an easy bonus- as an example, if you deposit the maximum amount of $/€100, you’ll have another $/€100 to use across all of Arcanebet’s esports betting markets. The sign up bonus is subject to a 5X rollover requirement, which must be met within 180 days after you claim the bonus, otherwise the bonus money will be voided from your account. Arcanebet and EsportBet.com’s match deposit bonus code: Arcanebet offers all of our readers here at EsportBet.com the chance to claim a 100% deposit bonus up to $/€100 (or other currency equivalent) with no minimum odds by using the deposit bonus promo code, ‘esportbet‘ while processing your deposit across any of its numerous supported payment services. Like with the sign up bonus, this exclusive bonus comes with a 12x bonus rollover wagering requirement before you can withdraw any winnings. Check out our more detailed guide on how to claim the Arcanebet.com/Esportbet.com deposit bonus code here. Betway.com is one of our top recommended esports betting sites for European and UK punters because of its reputation as a safe and trustworthy bookmaker thanks to its world-class gaming licenses with both the Malta Gaming Authority and the United Kingdom Gambling Commission, which ensure 100% fair and responsible betting at the site. Betway is also an active sponsor of many esports events, including the Dreamhack Cluj 2015, ESG Tour 2017 and ESL Pro League 2017, and is the principal sponsor of Ninjas in Pyjamas, one of the biggest professional teams names in the CS:GO and LoL competitive scene – so they actually care about esports and offer several special betting markets for the top games. We love their very simple yet easy-to-claim welcome bonus, which all new players can get by signing up via our links. While they have only one bonus to claim and no specific esports bonuses at this time, bookmark this page for any future changes. For more information, please read our Betway esports betting site review. 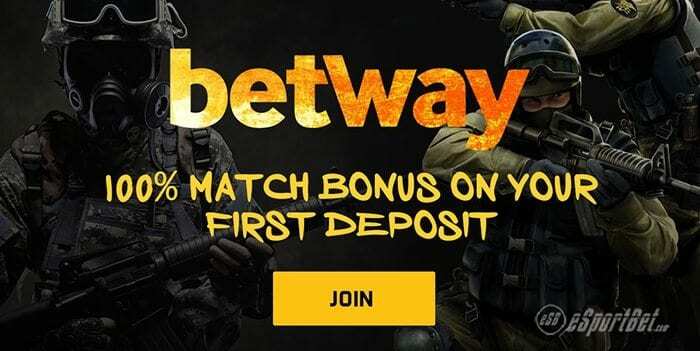 Betway sign up bonus: Simply sign up to Betway and make your first deposit, and Betway will match your amount by 100%. You can double your opening account balance within moments of registration and use the extra credits to place bets on your favourite CS:GO, Dota 2, LoL, Overwatch and StarCraft II matches and tournaments instantly. Betsson.com is one of the best esports betting sites and sportsbooks for customers from Europe, the Philippines, and the United Kingdom. With over 40 years in the betting business, they have a significant reputation in the online sportsbook community and were one of the first to properly offer esports betting markets to competitive gaming fans – expect to be able to wager on CS:GO, LoL, Hearthstone, PUBG, Rocket League, WarCraft and more. Betsson have an easy, generous bonus offer for esports fans to claim, along with regular one-off promotions you can access while logged in and betting. For more information, please read our Betsson esports betting site review. Betsson bonus bets offer: Esports fans can claim €/$25 in bonus bets if you create an account at Betsson with us and make a real money deposit. 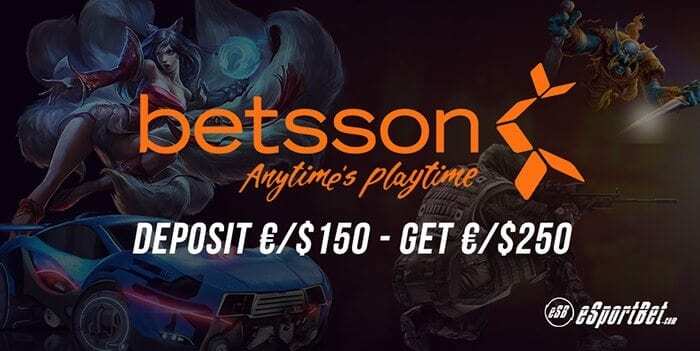 Betsson will match your first deposit amount 100% up to a maximum of €/$25, meaning if you deposit the full amount, you can have double the amount of cash to bet on your favourite esports tournaments with. While less than many other bonuses, it is very straightforward and will suit casual esports bettors the best. BetOnline.ag is one of the best esports betting sites for those who prefer to wager in bitcoin cryptocurrency. It’s also specifically tailored to North American sports fans of all leagues and codes, so US esports bettors who lack many of the online options the rest of the world have will be happy to know you will be right at home and well catered for here. Whether you wager in US Dollars or Bitcoin, USA esports fans who want to place bets on CS:GO, Dota, League of Legends, Overwatch League, PlayerUnknown’s Battlegrounds and many other mainstays will be happy to know there are two specific, very generous bonuses which reward those who prefer to wager with fiat currency and those who like the flexibility Bitcoin provides. For more information, please read our BetOnline esports betting site review. BetOnline’s 50% Welcome Bonus: BetOnline will match your first real money deposit at the site up to 50%, with a minimum of $25 deposited to be eligible for the welcome bonus. BetOnline will match your deposited amount up to a whopping maximum of $2,500, so long as you enter the promo code ‘NEW2500’ at the cashier while making your deposit. 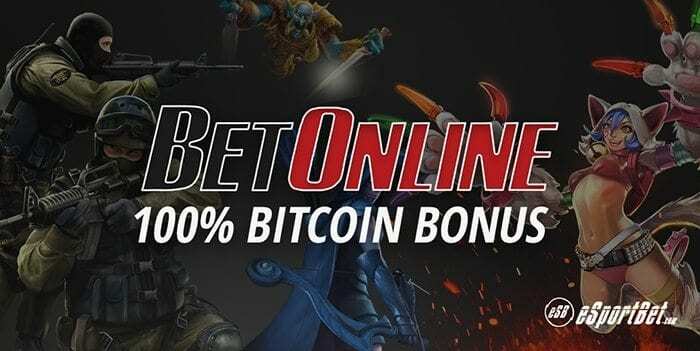 BetOnline’s 100% Bitcoin Bonus: If you prefer to bet on esports using bitcoin, BetOnline will match your first deposit 100% up to $1,000, with a minimum of $20 deposited to be eligible for the Bitcoin bonus. BetEasy.com.au is our top recommended esports betting site for fans living in Australia, New Zealand and South East Asia. It offers extensive esports betting markets in addition to its regular sports and racing betting options, and out of all Australian-licensed bookmakers, it tends to have the most competitive odds and earliest esports markets up and running before the competition. BetEasy currently takes wagers on all of the major esports tournaments for CS:GO, Dota 2, LoL, Overwatch, StarCraft II and WarCraft, but from time to time does offer markets on less popular esport competitions for Rainbow Six: Siege, Rocket League and Street Fighter. For more information, please read our BetEasy esports betting site review. BetEasy esports bonus bet: Australians and New Zealanders can claim up to $500 in bonus bets if you make a real money deposit at BetEasy after signing up with us. BetEasy will match the amount of your first deposit 100% up $500 maximum, potentially giving you another $500 in extra credits to bet on esports with if you deposit the max limit, which is great value. The bonus only lasts seven days, with wagering requirements turned over at odds of $1.50 or greater, and certain states in Australia are unfortunately excluded – VIC, NSW, SA & WA – due to local sports betting laws.